Experts reveal how to make your logo shine across multiple platforms. "We're all living on phones – that's the first thing you touch in the morning and the last thing you touch while you're sacking out," laments graphic designer Aaron Draplin. "We're these little cyborgs – phones are appendages, our babies are being born now with their hands clamped around these things." While Draplin might have some pretty original takes on biological evolution, his broadside underscores a point much more relevant to his trade: where tiny screens are our primary interaction with a company, product or person. That obviously has big implications for the people branding them. Logos have to work smaller today than ever – which means they have to work a lot harder, too. “In the ‘good old days’ a logo was always printed, and might make it onto TV, but that’s not the starting point today,” says James Sommerville, who recently left his role as VP of global design at Coca Cola. The importance of scalability in logos is, of course, nothing new. Since the dawn of corporate branding, logo designers have had to consider that their creations must look as great on a business card as a billboard, as recognisable on a candy wrapper as on the side of a bus. But what’s different now to in Rand and Bass’ day is the scope of what these logos can, and have to do: onscreen, they can move, perhaps make sound, shape shift. Yet they still have to sing on boring old 2D too. An even bigger shift isn’t just the basic idea of how and where a logo’s applied, but what it stands for. Alex Johns, creative director at DesignStudio, points out that how we interact with a brand is “way more nuanced” today, even compared to five years ago. With all these newfound possibilities – not to mention the software to create them – it would make sense to assume that today’s graphic designers are gleefully ripping up the precedents set by their forebears and running wild. So are 21st century logos a reflection of the possibilities of experimentation and adventure that designers have at their fingertips? Many would argue very much the opposite. Christophe De Pelsemaker, a Belgium-based graphic designer who recently co-authored the (as yet unpublished) book Letters As Symbols with Paul Ibou, sees technology as a hindrance rather than a help when it comes to creating a smart logo design. "A computer enables you to make more mistakes," he says. "That’s not necessarily a bad thing, but it isn’t a good thing either. Now, we just put something on the screen and if we don’t like it, we erase it. Back in the day, a designer really had to think about the concept before they drew a line on a paper." "Without a concept, you cannot create something good. Now, with the help of computer, a lot of designers skip the conceptualisation, or thinking phase. That's why, I think, good logo design isn’t as common today." Sommerville agrees. "I think some of the craft has gone," he says. "Now that things are so fast and it's so easy to iterate, it feels like there's less longevity in logos. Identities have a short fuse now that everything’s so disposable. A great design is one that has the time to live its own life." This emphasis on story and meaning in logo design is by no means unusual. Ian Anderson, founder of The Designers Republic, is famously non-design-school educated (he studied a philosophy degree instead), and his work’s conceptual underpinnings may well have a lot to do with that. “My interest has always been in people, and understanding what people do or don’t do, and why,” says Anderson. “My work is informed by belief systems – why do people believe in god, and not in fries that live at the end of the garden? Why do we act on what we believe? That all feeds into logo design." "We tend to hop past that now and straight into the funfair of branding. My interest in graphic design is only based on what it can communicate and how it can provoke responses." He suggests that having not been to design school might have meant he’s less "easily seduced by form", or by particular trends: "When you're just interested in impressing other designers, it will always be more about surface. I want a design to look good and work well for a reason." Indeed, some of the classic logos we hold up as embodying wit and greatness are those we’ve spent time with and with rigorous underpinnings – think the FedEx hidden arrow designed in 1994 by Lindon Leader for Landor Associates. Not only was this sort of design born of a time with more limited software possibilities than we have today, but as Sommerville suggests, the likes of Alan Fletcher – perhaps most famous for his Victoria and Albert Museum (V&A) logo – likely worked with different agency structures. "A lot of those iconic logos are a diffusion between great design work and great advertising, combined in one logo. There's a storytelling approach to something like [Fletcher’s] V&A logo: you see that alone on a poster and it's an ad itself." An animated website header? A moving billboard? The designers making the most interesting – and, crucially, the most effective – logos are surely the ones considering the impact it has not just as a drawn thing on the page, but also a moving one that sits beautifully within the various lives of consumers. Of all the trends that have dominated branding in recent times, there’s one that trucks along more doggedly than any other: simplicity. Flatness. ‘Paring back’. Last year, we surmised that “simplicity has been king for a while" And it seems that crown isn’t set to slip any time soon. Take last year’s Moonpig redesign: the (albeit quite hideous) little piggy was given the boot (as was, finally, the ‘dot.com’) in favour of a flat, simple, yet still rather kids’ party-esque new look and feel. Before that, Pentagram’s redesign of the Mastercard logo stripped things right back to their most basic components – just two, flat, overlapping circles and a new all lower-case word mark in safe, tasteful sans serif FF Mark. And it makes total sense that a primary consideration was the logo’s optimisation across multiple digital platforms. In 2019, Pentagram has simplified things further still by removing the wordmark entirely. Simplicity is not inherently a bad thing: some of the logo designs held up as among the best of the past decades are incredibly restrained. Vitally, such pieces are incredibly smart, too – a prime example being that V&A logo, which elegantly forms its A from the classic yet bulbous ampersand. It’s little surprise that the design has remained unchanged since it was created in 1990, and it still looks as fresh and confident as ever. “The brief stipulated the design should only comprise three characters (V&A), should be functional, dateless, memorable and appropriate,” said Fletcher of the piece. If its enduring use in the Museum’s present campaigns is anything to go by, he certainly nailed it. The perfection of the logo also means that for designers working with the logo today, it’s both a dream and something of a delicate balance. Chris Curran, cofounder of The Studio of Williamson Curran, recently worked on a campaign for the museum’s The Future Starts Here exhibition. Recently though, simplicity could be said to rarely pack such a well-aimed punch. Eye on Design managing editor Liz Stinson recently coined the term “millennial minimalism” to sum up the trend over the past few years in commercial graphics centred around sans serifs, monochrome palettes and “flat photography”. As she puts it, it's a trend born of digital-focused strategies and, "years of seeing some variation of the same minimalist logo again, and again, and again". The result, many in the industry surmised, is sameness. Such accessions of homogeneity may be slightly unfair though – are we judging a brand on the outdated (slightly short-sighted) criteria of a single logo, where we should be looking at its modern counterpart – a moving, interactive, altogether more nuanced “system”? Are we – Twitter-botherers, consumers, and the design industry at large – being a little too quick to judge? If there’s a studio that knows a thing or two about what makes a good logo, it’s Amsterdam’s Studio Dumbar. Founded by Gert Dumbar in 1977, its portfolio takes in many projects held up as gold standards when it comes to corporate graphics, including work for Dutch Railways, Amsterdam’s NEMO science museum, the Dutch government and its National Police. Yet while its history isn’t to be sniffed at, as the studio’s creative director Liza Enebeis points out, it’s unwise to indulge in misty-eyed remembrances of a so-called ‘golden era’ of design that may or may not exist. "When you speak to your parents or grandparents, they’ll always say things were so much better in the past – usually when they were in their teens," she says. "A lot of designers can look back and say how brilliant or better corporate design was in the 1960s, or the Modernist era, but now we have so many more possibilities. We can adapt logo and identity design to so many different platforms and media and redefine how we approach branding." “That’s a huge challenge, obviously, but it means you really have to work hard to find a way to make the mark you create stand out,” she says. Motion plays a bigger part in logo design than ever before. This has dual consequences: on the one hand, a logo has to work harder than ever, and on the other, that logo takes a backseat as it becomes part of a far wider graphical outcome. Dumbar’s work for Jeugdfonds Sport & Cultuur (Youth Sport Foundation and Youth Culture Foundation) saw the studio begin by sketching in motion before distilling the movement into stills whenever needed. “It was another way at looking at identity that’s all about movement,” says Enebeis. As a result, the designs are hugely energetic and radiate positivity: exactly what was needed for a brand that looks to promote the potential in the young people it works with, and is intended to speak directly and respectfully to a youth audience. Such projects celebrate the potential of logos not as standalone entities, but part of far broader, more dynamic communication systems. Another Dumbar project proves that this approach need not just be for brands aimed at youth or playfulness, but for more traditional institutions. Its work for string orchestra the Amsterdam Sinfonietta, whose musical repertoire includes everything from baroque to contemporary, answered a brief to refresh public perceptions. Studio Dumbar’s solution was to take full advantage of today’s technical possibilities, creating an identity driven by a bold logotype and typographic palette but which evolves by responding graphically to each performance’s musical themes through reacting to sound. Back in 2018, DesignStudio created a new identity for Barcelona-based data start-up Typeform, inspired by Spanish artists including Picasso and Miró. The identity eschews a traditional system that takes a logo at its heart, instead – again – looking to motion: the logo itself is “living” and mutable, taking on different forms according to factors including whether it’s representing complex data, or looking to express more abstract emotions. As such, a design system will still include a logo, but for many brands that are built to be used digitally over and above print campaigns, packaging and so on, sound and motion are as integral as a mark to be popped on a business card or even a website header. Agility is key. A lot of it simply comes down to doing the right thing for the right project. “Some people are interested in typographic forms, but what I’m more interested in is understanding the situation,” reinforces Anderson. In his logo for Warp Records, for instance – a label known for its boundary pushing electronic music roster – the idea was to communicate something that was futuristic, but wouldn’t date. “Things that look ‘futuristic’ date very quickly, as that version of the future will never happen,” says Anderson. “So I wanted to just have a logo and a colour that people would recognise.” The resulting mark is a stretched, gridded planet-like shape with a zig zag holding device that hits you like a comic book “ZAP!”, often used with a distinctive brand purple. Simplicity, as we’ve discussed, doesn’t mean boring: the sweet spot between dull minimalism and smart minimalism is in that ability to distil a brand’s essence in just one mark. The success of a logo is, of course, a highly individual thing: it has to truthfully, potently speak of a brand’s essence, whether that’s in a direct or more abstract way. Chanel’s timeless interlocking ‘C’ mark achieves the same thing: it’s beautifully crafted, simple typography, but an utterly memorable distillation of the brand’s essence. Today though, clarity need not solely refer to the simplicity with which we recognise or understand a static mark. That clarity can be born of recognising a brand through our interactions with it – through its wider values and place in the world, and how we engage with it on a far more personal level. A design brief’s outcome is wildly different to what it was once expected to be – and there’s a lot of excitement and freedom in that. For Johns, a crucial part of DesignStudio’s ethos is in its belief that best practice is there to be confronted and pushed. Why does a logo have to mean something? Why can’t it just create a feeling, and be exciting and intriguing? While it’s easy (and for many, fun) to wage keyboard-warfare until the cows come home about the sameness of today’s marks – especially those for digital start-ups – perhaps the most radical thing we can do is to sit back and really think about what we’re judging and why. 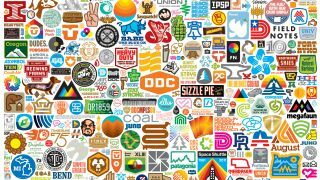 Perhaps all the logo-bitching and cries that craft is dead are misguided for one simple reason: logo design isn’t stale or boring, we’re just judging with outmoded criteria. “A brand is so much more than a logo,” says Johns. Sure, it’s wonderful to look at the greats – to pore over the hefty Standards Manual reissues, to worship at the altars of Rand, Fletcher, Chermayeff and others, but it’s vital for us in 2019 to consider that these weren’t created as neat black and white totems of ‘great design’, but as the boundary-pushers of their day. A shorter version of this article was originally published in issue 286 of Computer Arts, the world's leading graphic design magazine. Buy issue 286 or subscribe here. Which logo do you wish you had designed?